Welcome to a very exciting learning adventure! We believe that by raising public awareness about the world's oceans, whales, and other marine organismsas well as the human activities that threaten themwe can get students interested in working to create a healthy future for the environment. Video and Audio "shorts" in Science From the Field of whales, dolphins, and other sea creatures, with explanations from educators and scientists onboard the Odyssey. Student Q & A with the ship's scientists. Selected questions and answers will be posted in Questions and Answers. Virtual teleconferencing between the ship's crew and students throughout the U.S and other regions. New to Class from the Sea - email the crew of the Odyssey ( email address: chrisj@oceanalliance.org ) - we will post the best emails online in the coming weeks. 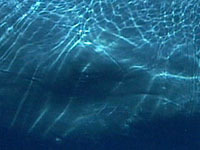 Take a look at our Ocean History section. We will presenting pieces relating the the oceanic and nautical histories of each area we travel and look at their impacts on the modern age. Also, check out the postings already available in Science From the Field and Questions and Answers, and the existing Teacher Resources available at PBS Online and elsewhere.